(MODEL RELEASED IMAGE). After pounding rice into flour in a large wooden mortar, Pama Kondo sifts it to get rid of any remaining hulls. 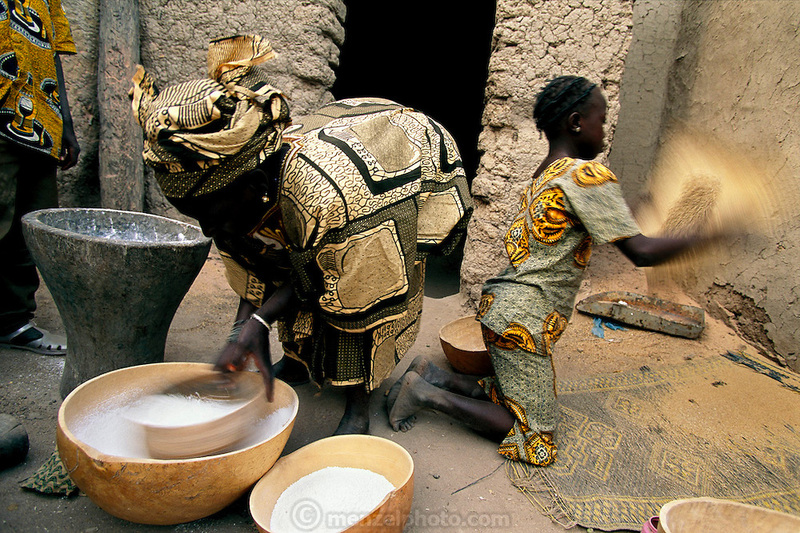 Behind her, 10-year-old Fatoumata (daughter of Fatoumata Toure, Pama's co-wife) does much the same with some sorghum. Can she foresee a day when she will no longer have to pound grain? "That's what children are for," she replies seriously. Hungry Planet: What the World Eats (p. 212). The Natomo family of Kouakourou, Mali, is one of the thirty families featured, with a weeks' worth of food, in the book Hungry Planet: What the World Eats.